Earlier this year I wrote about one of my favourite donor care messages from University of Queensland. Messages such as these, and the one I received early week from the Wisconsin Alumni Association, are wonderful ways to show the love for your donors. These stewardship pieces are cost effective to produce and very fruitful in sharing the joy. These pieces are also great motivators for people to continue their support by making an immediate gift at calendar year end. Happy Thanksgiving to everyone, worldwide! 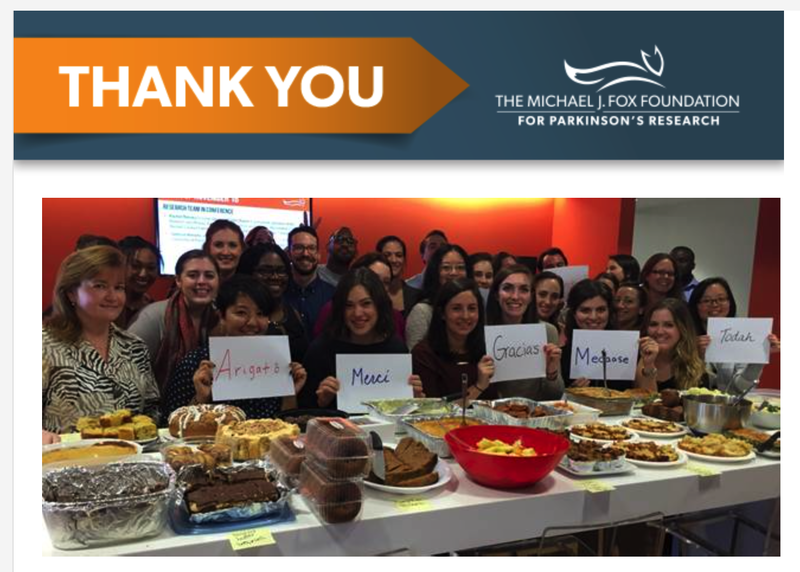 And, to the charities taking the time to send these messages of gratitude out – thank you! You not only made this donor feel good, but you also added variety to my in box this morning, which is full of “black Friday” sales offers from retailers. Kudos. When I teach fundraising classes for Fundraising Institute Australia and others, I often times draw distinctions in fundraising in the UK, US, and Australia. One distinction I draw is the difference in direct marketing and major gifts fundraising between the US and their UK and Australian counterparts. Perhaps an over generalisation, but direct marketing is much stronger, particularly regular giving programs, in the UK and Australia than in the US. And, major gifts are far stronger in the US than in the UK and Australia. 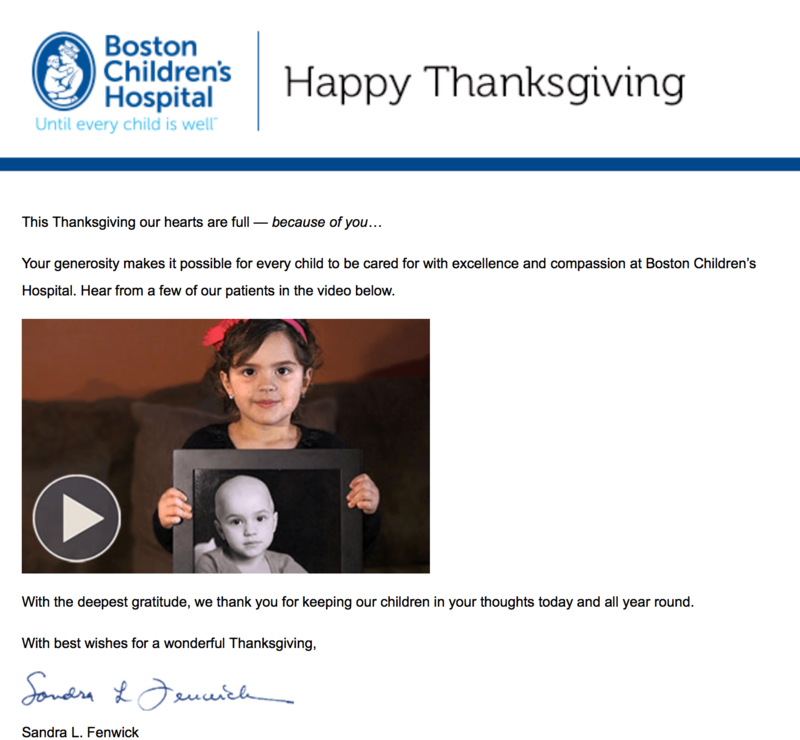 Take this email I received from Dana-Farber and The Jimmy Fund as an example. The email suggests I consider a gift of stock at year-end. Gifts of stock are a popular means for US major donors to give due to their appreciation and tax benefits. US non-profit organisations and charities actively seek gifts of stock from their prospective donors throughout the year and, in particular at year-end. I received a second request this week for gifts of stock. This one is from Florida State University (FSU). 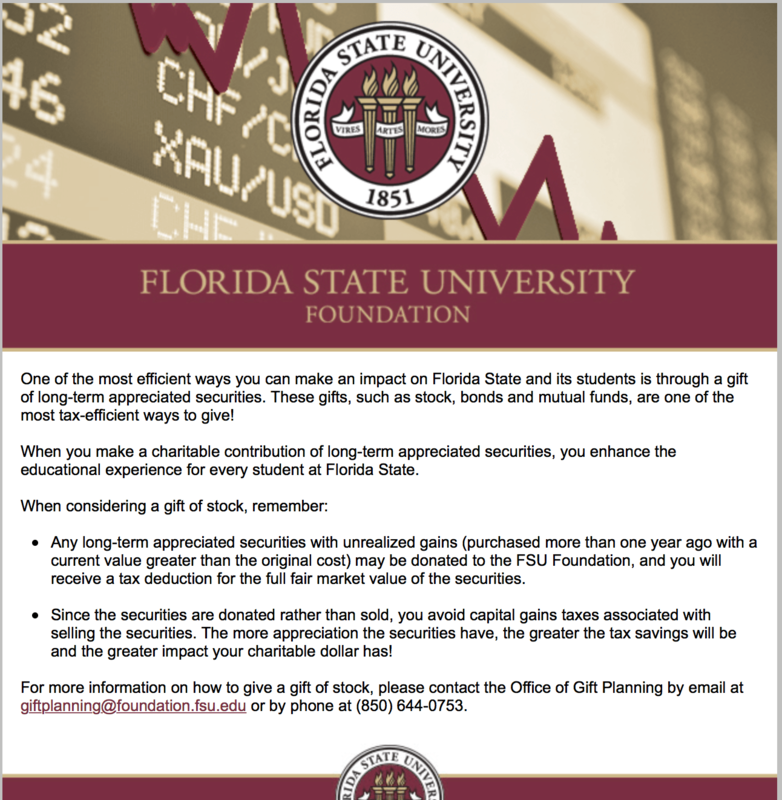 FSU points out the tax benefits of making this type of gift. Australian charities may take a page from the US nonprofit playbook. Think about prospective donors who have an affiliation with your nonprofit organisation and who may have appreciated stock. Perhaps these prospective donors are employees of US corporations and part of their compensation package includes securities. The Wisconsin Alumni Association (WAA) sent their Thanksgiving greetings yesterday by way of video message to WAA members. The well-rounded piece included a multitude of thanks from Paula Bonner, CEO of WAA, as well as a view of the campus, students, and activities, and what’s to come in the future. This is a perfect example of a superb donor care video and good, solid stewardship of donors. I personally loved the ask for a gift when I opened the page as much as I did the video. The ask did not come at the end, but prior to even selecting play. Wisconsin has a great tradition of raising a lot of money via its UW Foundation and also WAA. The alumni community is grateful to UW and shares love back in more ways than their pocketbook. Nonetheless, it is fantastic to see the love sent our way in a creative piece such as this Thanksgiving message. Wisconsin and the WAA really gets donor care and stewardship. To all my fellow Badgers, Happy Thanksgiving! You may recall, I have written about hand written envelopes prior and their ability to capture a donor’s attention amongst a mountain of mail in our letterboxes. Bush Heritage Australia nearly got there last week with this interesting piece. I received an appeal from Bush Heritage Australia and the carrier had an interesting font, which is unusual and particularly stood out amongst the charity mail received last week. Hand written envelopes (not actually hand written at all, but machine produced in a hand written font of the non-profit’s choice) are rare. The fact is we receive hand written Christmas cards (becoming rarer these days), birthday cards, and perhaps the occasional thank you note. But, how many charities send hand written devices to stand out amongst their peers? Getting the piece delivered to the correct party at the correct address. Getting the piece responded to. To achieve #1, you have to practice good data hygiene. To get to #2 and #3 you must produce a captivating piece, which will not end up in the recycling bin. I am not suggesting your organisation will employ hand written as a strategy for every appeal. But, testing it for one appeal next year would be prudent. Your suppliers likely have the tools, in house, to produce hand written pieces. 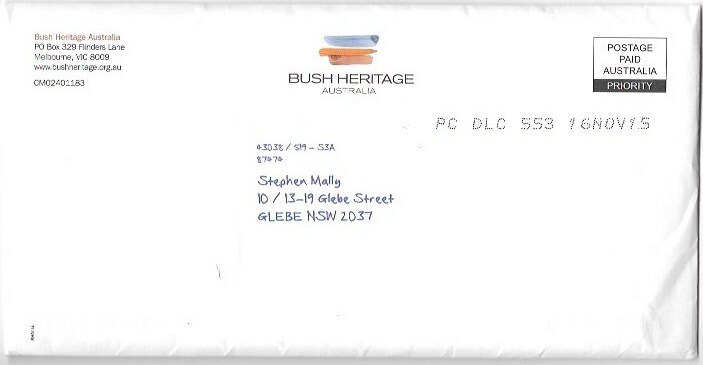 Bush Heritage Australia produces outstanding pieces of direct mail. Last week was an example of how Bush Heritage Australia stands out often in my letterbox. How will your non-profit organisation stand out in letterboxes in the new year? Charity Christmas cards – have you purchased? Christmas balls in winter setting,Winter holidays concept. Christmas cards are certainly not sent at the same volume of the ’80s, ’90s, or, even, ten years ago. However, Christmas cards are still sent by many suppliers and individuals. Have you purchased your Christmas cards to send to customers, family, friends and neighbours? Are the greeting cards benefitting a charity? How few direct charity programs appearing on the first page of the search. The number of companies selling cards and allowing consumers to designate the benefiting charity. Three direct charity programs resulted from this Google search, including: Oxfam, The Smith Family Foundation, and Surf Life Saving Foundation. 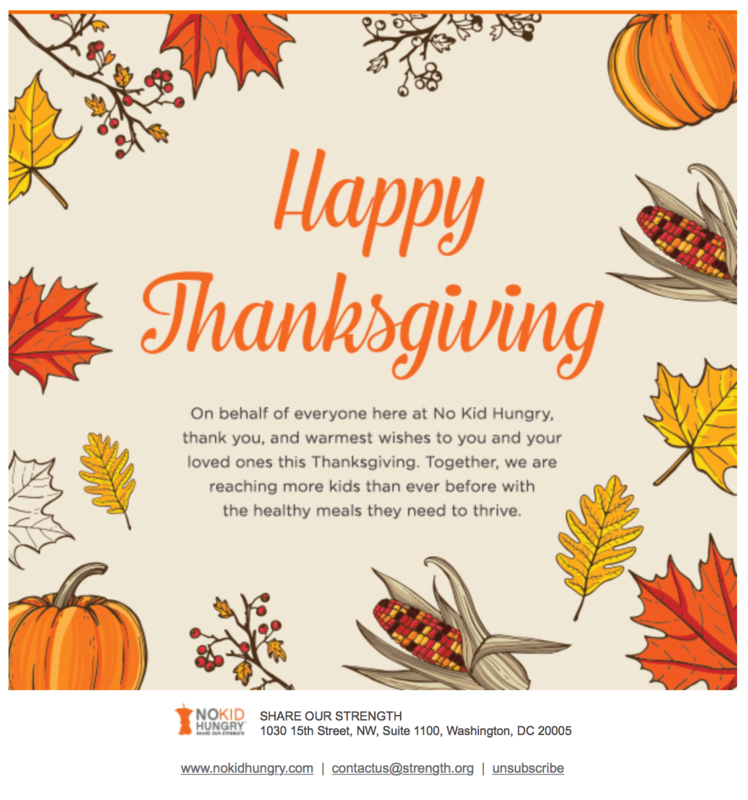 Some companies resell charity Christmas cards, while others give you the freedom to design your card and designate the charity of your choice to benefit from a percentage of the cost. There is a lot of competition in the charity greeting card space. 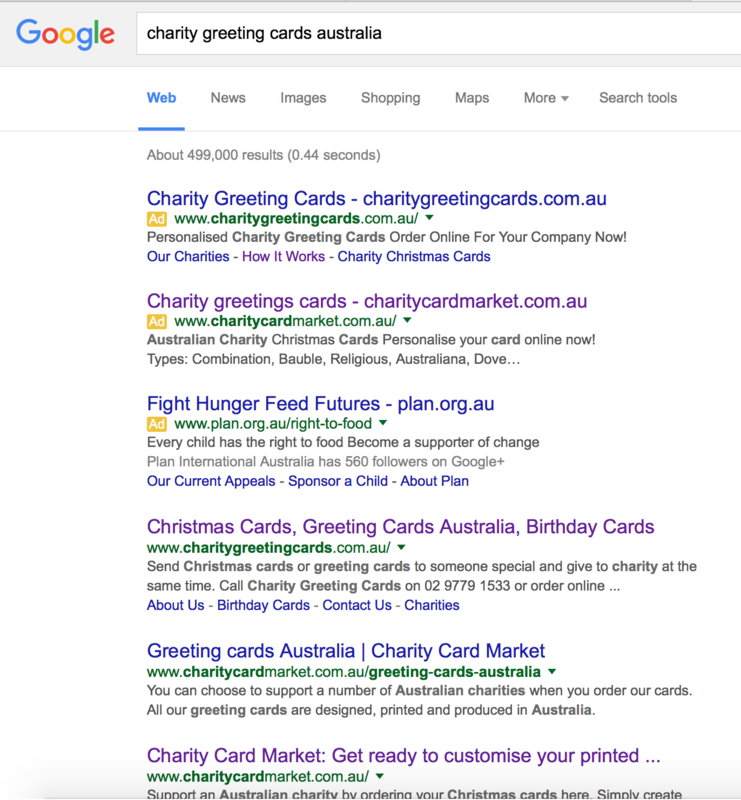 It is likely most consumers do not decide to purchase a set organisation’s cards based on a Google search. Nonetheless, to stand out to those who may search online for cards, and above the corporate programs, charities need to do a better job to improve their standing in search results. Does your non-profit organisation use bar coding to scan response devices for the tax or Christmas appeals? I give to hundreds of charities a year – partly for the FundraisingForce mystery shopping study and others for personal reasons. Very few of the organisations supported through the mystery shopping study or on my own use bar codes on response devices. 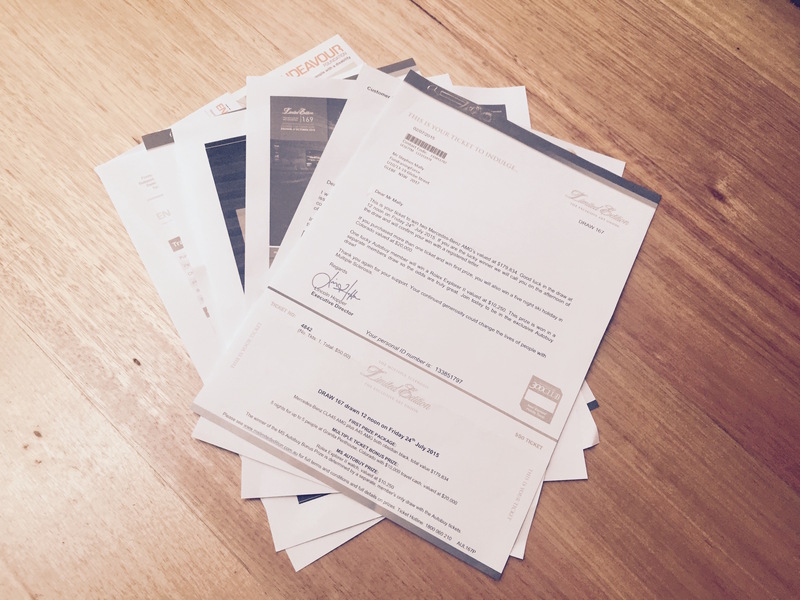 Endeavour Foundation utilise bar coding on their lottery mailings. Bar codes are generated by the organisation’s CRM and often times contain components the organisation wishes to track, including supporter number, campaign, designation, appeal, segment, package and other important metrics. Some organisations use bar codes for ease of data entry for acquisition campaigns. In this case, the CRM recognises who the person is, and the associated workflow creates a new supporter record in the CRM, and records the other components at the same time. Imagine the time savings for your supporter services team. Time which can be spent ensuring the donor receives a receipt within the required 48 hour time frame and time which can be spent on other matters. Your non-profit organisation may already have the tools to create the bar code and a CRM which will consume the bar code. A little time invested in establishing the workflows in your CRM to manage the process described may pay multiple dividends in the long run. This time of year, time is money. Actioning this process will be a nice year-end gift to your supporter services team and…to your donors. My Aunt was recently diagnosed with dementia. Why is it OK for people to make jokes about Alzheimer’s disease or dementia? Dementia is no laughing matter. So, why do people feel they have permission to joke about dementia/Alzheimer’s disease when it is discussed publicly? I recently attended a fundraising conference where a well-known presenter joked about Alzheimer’s. He was talking about people who leave money to charity in their estate and he wove a terrible comment about the disease. He was trying to be funny – Jimmy Fallon he was not. People make statements like “I bet she does not remember”, “Don’t worry, she can’t remember it anyway” and other such inappropriate and insensitive comments. If my Aunt had been diagnosed with breast cancer, would these same people joke about her breasts? Or, if this had been an uncle or male family member who had been diagnosed with prostate cancer, would these same people joke about the prostate? It seems people feel Alzheimer’s is an opportunity to attempt humour. Why is any diagnosis an opportunity for someone to try to make light of the situation? If the tables were turned, would these same people like inappropriate comments made about their family member or friend? I think not. 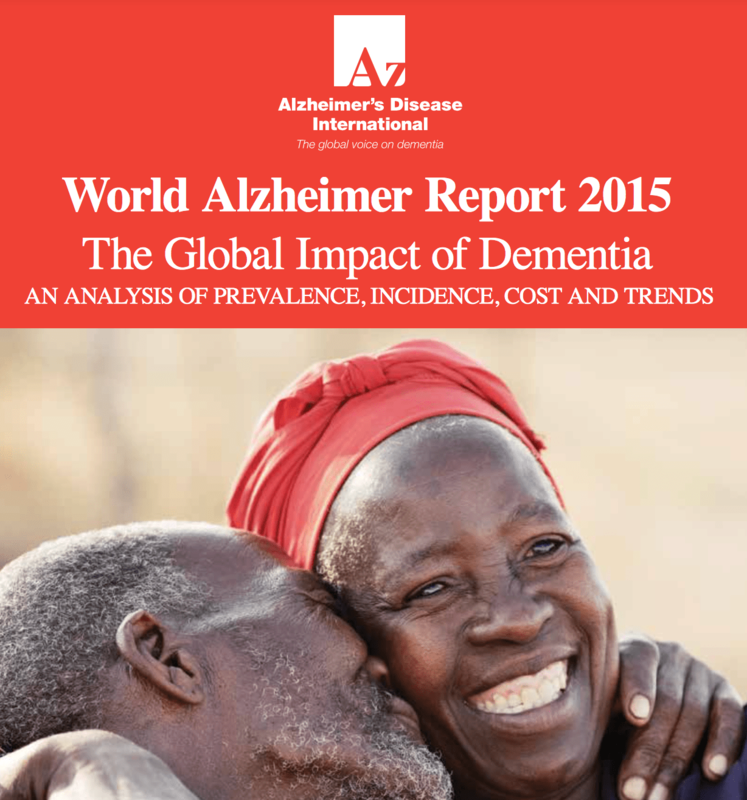 The fact is dementia impacts about 46 million people worldwide (that is larger than the size of the country of Spain). Someone is diagnosed every three seconds. According to the Alzheimer’s Disease International World Alzheimer Report 2015, Alzheimer’s will become a trillion dollar disease by 2018 and it will impact 131.5 million people by the year 2050. Everyone reading this blog will know someone in his or her lifetime that will be impacted by dementia. Will it be your parent? An Aunt? A sibling? A close friend? If it does not currently impact you personally, these statistics suggest Alzheimer’s disease will impact each one of us, as well as our global economy, and our society as a whole. Want to take action today and do something about Alzheimer’s disease to fund research or help family members dealing with the issue? Contact the Alzheimer’s Association in your country to make a donation. Dementia robs the person’s ability to remember things like what they ate for lunch, who visited them today, or where they placed a book they were just reading or the remote control they were just using. Eventually my Aunt will not remember me, my sister, and even our mother (her sister). Sure, there will be funny things she will say and the pain of making light of the situation will go away. But, I suggest we all know our audience when talking about diseases or responding to conversation. Sometimes a simple “I am sorry to hear that” is far better than joking about a disease. Perhaps saying nothing at all is an even better approach. Of all the charities I give to throughout the year, within the FundraisingForce mystery shopping study and independent of, I am surprised how few charities offer BPay as an option on the giving menu. Donors prefer choice. BPay should be added to the menu of giving options for your charitable organisation. BPay is very popular in Australia for you and I to use to pay our monthly bills. We use it for rent, mortgage, credit card, and other payments. Electronic bill pay is far more popular in Australia than it is in my home country, the United States. In fact, in the US, cheques are still the preferred method. This is particularly true amongst the over 65 age group. In Australia, the direct marketing target audience is largely over 65 and this group is already conditioned to prefer BPay for day-to-day business. Why not offer them BPay on your charity’s direct mail response devices? 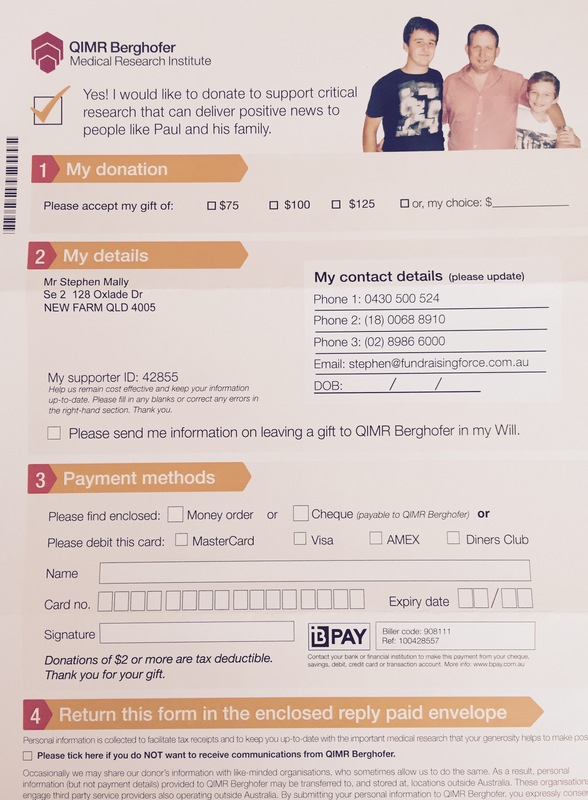 QIMR Berghofer Medical Research Institute (QIMR) is one such organisation offering BPay. QIMR have offered BPay for the last 7 or so years. QIMR use functionality in The Raiser’s Edge, which produces a BPay number based on the algorithm required by their bank. The Raiser’s Edge automatically creates a BPAY number for all new constituents added to the CRM, and it creates one for anyone in the database who may have been missed through a batch functionality. This smart technology means QIMR are able to offer choice to donors above and beyond their counterparts in the sector. Does your non-profit’s CRM offer BPay creation for your donor records? I wrote a blog post recently about travel audiences being captive audiences and I asked why more travel companies do not promote charities and charitable activity to this audience. With more than 23 hours of flight time on recent flights on Emirates Airlines from Amsterdam to Dubai and Dubai to Sydney, I felt that captivity! Emirates Airlines did a tremendous job promoting the Emirates Foundation on its aircraft, in the airline’s magazine, on the television monitors, and throughout the airport. The Airline, in fact, asked people to give online to the Foundation, donate onboard, donate airline miles, and to purchase Foundation merchandise via duty free onboard. Additionally, in the Emirates business class lounge there were coin collection stations encouraging people to give their foreign currency. Dubai is the homebase for Emirates and the traffic through the airport amounts to some 75 million passengers travelling annually. Dubai is the third busiest airport in the world. Clearly Emirates is playing to the audience and encouraging us to give with a menu of options. Emirates also published a bit of a mini annual report or a project update to educate us about projects funded by the Foundation around the world. Congratulations to Emirates and to the Emirates Foundation for a stellar job promoting the Foundation’s good work. You caught this passenger’s attention and kept it throughout the journey.